Read “My Name Is Cybernetic Model XR389F, and I Am Beautiful” for Free! Hey readers! Today I’m pleased to inform you that Uncanny Magazine Issue 25 in all its beautiful glory, is now available for you to read online. My short story, “My Name Is Cybernetic Model XR389F, and I Am Beautiful”, went live today along with “The Thing about Ghost Stories” by Naomi Kritzer. There are a LOT of great stories, poems, and essays in this issue which also includes “How to Swallow the Moon” by Isabel Yap, “An Account in the Land of Witches” by Sofia Samatar, “Smile” by Beth Cato, “Monologue by an unnamed mage, recorded at the brink of the end” by Cassandra Khaw, and a primer for Jewish Science Fiction and Fantasy by Steven Silver. 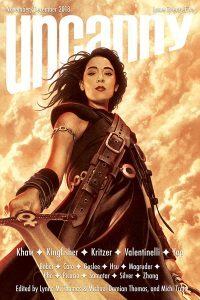 For the full Table of Contents, ways to support Uncanny Magazine, and free-to-read stories, poetry, and essays, you can visit Uncanny Magazine Issue 25. Huzzah! Monica Valentinelli is a writer, editor, and game developer. Her portfolio includes stories, games, comics, essays, and pop culture books. 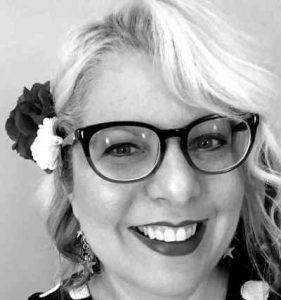 In addition to her own worlds, she has worked on a number of different properties including Firefly, Vampire: the Masquerade, Shadowrun, Hunter: the Vigil, Brandon Sanderson’s Mistborn, and Robert E. Howard’s Conan. Looking for Monica’s books and games that are still in print? Visit Monica Valentinelli on Amazon’s Author Central or a bookstore and game store near you. Want to Interview or Hire Me? Send Fan Mail? Would you like to hire me? Because my projects and manuscripts are in flux, I am always open to discussing new opportunities with publishers and studios. As a full-time writer, I spend a portion of my time seeking new gigs–so don’t be afraid to reach out. If you’re interested, please e-mail me via my Contact Page. I typically reply to work-related e-mails within one-to-two business days. Want an interview? If you’d like to interview me or request a guest blog post, please connect with me via the contact page, too. Due to time constraints and other communicative concerns, I typically don’t follow up on requests via social media. Keen on sending fan mail? I am also happy to engage with readers and fans. Please note that I am unable to reply satisfactorily to certain types of queries related to the companies I work for due to the agreements I typically sign. If you have a question about a TV show or a line of books, the best way to get your answer is to contact the studio or publisher directly. [New Release] A Happy Gnome to Benefit Extra Life! Check out my interview with Jonathan Mayberry for IAMTW! Make Art Not War Challenge 2019: Warm Up with Febrrrary! [New Release] Firefly TV Show Encyclopedia + Bonus Interview with Tony Lee!